In baseball parlance, they say that ladies love the long ball. When it comes to hockey, there’s nothing like the windup that comes with a booming slapshot to get the fans’ hearts all aflutter. Still, when it comes to getting a shot away quickly and accurately, nothing beats a good wrist shot. Like any skill, the ability to “grip it and rip it” comes with practice and the proper technique. From the smallest Peewee to the game’s top players, a willingness to work on the game’s fundamentals will pay dividends when the puck is on your stick in the final minutes of a close game. Over the years, USA Hockey Magazine picked the brains of some of the brightest hockey minds to find out the secrets to a great wrist shot. • Form: If you want to light the lamp in a game, you have to burn the midnight oil in practice. Players must execute the proper techniques if they are to develop the speed, consistency and accuracy needed to be an effective shooter. • Accuracy: If the shot is not on net, there is virtually no chance of scoring. Developing accuracy takes a great deal of concentration and practice. • Quickness: Time spent handling the puck gives the opposing players the time needed to position themselves to block the shot. If your release is measured by an egg timer, it’s time to work on a quicker release. • Variety: Shooting situations within the game vary greatly. The most skilled players have a variety of shots that match the opportunities that develop. The amount of time a player has, the location and defensive player positioning require that different shots (or variations of the same shot) be used. The length of your stick is a personal preference, but a good rule of thumb is to make sure it comes up between your nose and collarbone when you’re standing with skates on. If your stick is too long it makes it hard to skate and handle the puck properly. When holding the stick, your top hand should be at the end of the stick. The best way to check if your bottom hand is in the right position is to hold your top hand at the end of the stick then place the elbow of your other arm close to your top hand and then grab the stick. As you prepare to shoot, slide your bottom hand down the shaft of the stick slightly and tighten your grip. If your bottom hand is too far down on the stick you’ll be off balance and won’t get a good shot off. The position of the puck varies depending on the situation. You may not have time to tee it up the way you’d like. A lot of great goal scorers move the puck in toward their bodies as they get ready to shoot. This changes the release point and may fool a goaltender. It also allows you to generate more power when the puck is closer to your body than if your arms are away from your body. You can’t stand still and shoot a puck hard. You need to get your body moving forward to get momentum behind your shot. That means getting your legs into the act. It’s kind of like throwing a ball. If you have no forward motion, you won’t be able to throw a ball as fast and as far. And if you want to have a strong shot, use your legs, which are the strongest part of your body. Keep the blade of your stick cupped over the puck. Shift your weight from your back foot to your front foot as you slide the puck forward. Start the puck near the heel of the blade. As you bring it forward, it slides up the blade of the stick and is released near the toe of the blade. Your follow through will dictate the height and accuracy of the shot. To shoot at a high corner, follow through high. To shoot low for a corner, follow through low to the ice. You shoot to score goals and to do that you have to get the puck on net. It doesn’t matter how hard you shoot if you can’t hit the net. Coaches should emphasize accuracy over velocity. It’s important to be able to shoot off both feet and practice a quick release. But before you start cranking shots that way, it’s best to learn how to properly transfer your weight from your back foot to your front as you’re following through on a shot. You’ll get more power this way. • For young players, have them practice the proper technique using lighter pucks that are properly suited to their strength. • Remember that success goes a long way to developing confidence. 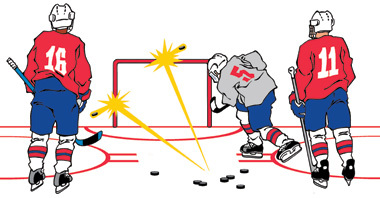 Learning to get off a crisp, accurate wrist shot using lighter pucks will help a younger player’s confidence. Stand about 10 feet from the boards with a puck. Practice shooting. The puck should come right back to you if you’re properly following through on your shot. If the puck rebounds off at an angle, you need to point your stick at an imaginary target and follow through. Line up a player in the slot and a coach in the corner with several pucks. On the whistle the coach passes a puck to the player, who has to catch the pass and quickly get off a shot. For a variation, a coach can pass the puck into the player’s skates or slightly away from his body. A player can practice shooting off of both feet and picking different areas of the net to aim at. Play “Around the World” with a couple of teammates. Standing out near the hash marks, the first player aims for the left post. If he hits it, he goes for the crossbar and then the right post. If he misses it, the next player goes. Once a player hits the two posts and crossbar, he has to reverse the direction, hitting the right post (again), crossbar and left post. The first player to go “Around the World” wins. For a more challenging game, move to the top of the face-off circle, or use slap shots, snap shots or backhand shots.